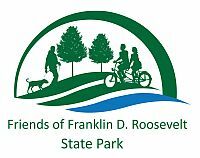 Help improve a trail which connects FDR State Park to Viewland Drive. We will be finish building a bike bypass around steps and building steps. Beginners are welcome, but must be over 12 years old. Bring work gloves, water, lunch. Contact Jane Daniels for parking pass. Meet at grassy area on the way to the pool parking lot,park near the kiosk and put parking pass on dashboard.